This post is intended as a starting point for online collaboration – let it be a launchpad for something you make yourself. I think the first time I heard the word renewal it was in relation to library books. 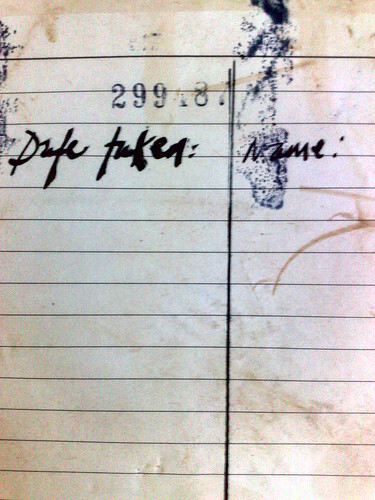 If you wanted to keep a book longer than the standard amount of time, past the date due that was stamped on a sheet inside the front cover, you needed to ask for that date to be extended and this was called ‘renewing’ or ‘a renewal’ otherwise, if you kept the book too long you’d be fined. You’d have to pay money to the library as a punishment for withholding the book from other borrowers. However if you renewed it, the librarian could check that no-one else desperately needed that book right now and give you a further borrowing period. It was the loan then that was renewed. It was re-new-ed, made new again. The book was the same book, I was the same small child, but there was a new date to remember in the front of the book, the date that must not be forgotten or ignored or else it will cost you pennies. Library tickets in my town were brown for children and white for adults. You could take and borrow as many books as you had tickets, because you had to hand them in when you had chosen your books and had them stamped. A new set of books for the week was so exciting. I was renewed. My collection was renewed. My imagination was renewed. You might make something that fits together with what I have here or it might stand alone. You might make something in another form or medium – a poem, a picture, a movie, a song. Take the picture, take the words and augment them, allowing them to augment you. You can join in wherever works best for you – I’m publishing this on my blog, on the Tuttle Moonthly publication on Medium and on Steemit. I will endeavour to pull strands together and play them back in each of these places.